Since over a year, Gerard and I decided to do something similar as Cars And Coffee, but for watch aficionados. It is more or less a ‘local’ thing and at best we are with 12 persons every first sunday of the month, enjoying a cappuccino or espresso in the first half of the day. 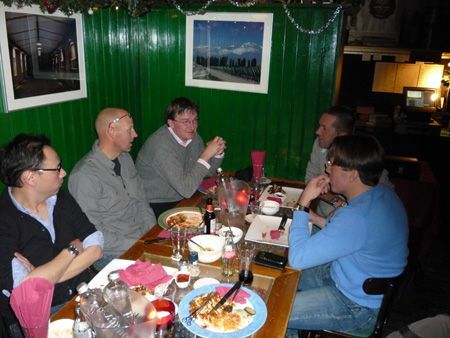 However, since November and December are pretty busy months, one of the guys decided that we at least should have a nice End of Year meeting. So we did, last Thursday. One of the attendees was Fred Dingemans, of Dingemans Mechanische Horloges, he was handing over a dmh time piece to Victor. 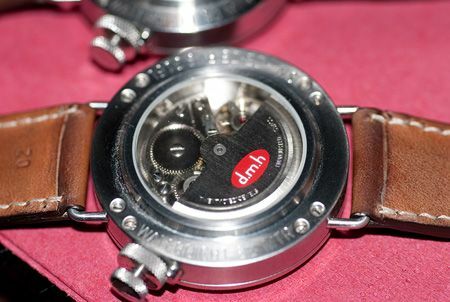 dmh is a Dutch brand, operated by one guy – Fred Dingemans – who is creating a maximum of 12 time pieces a year. Fred Dingemans uses his own machinery and tools to create a mechanical automatic time piece using his own design and being able to offer them for a fair price. Anyway, Victor got his custom made watch from Fred last Thursday, and as you can see in the pictures below, he was totally happy with it. 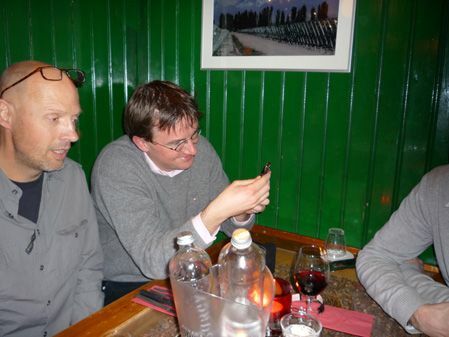 Frank (of Monochrome), who is also a monthly attendee, organized the special guest-surprise for Victor, who still thought his watch wasn’t finished yet. Other attendees were wearing: dmh watches (2x and 3x if you include Victor’s new watch), 2x AP Royal Oak 15300 (white & black dial), 2x Linde Werdelin (One and 3-Timer), Rolex OysterQuartz Date-Just 17000, Omega Speedmaster Professional pre-Moon of 1967, Glash?É¬ºtte Original Senator Moonphase and a few Favre-Leuba’s (new models). Only few watches made it on the pictures.. 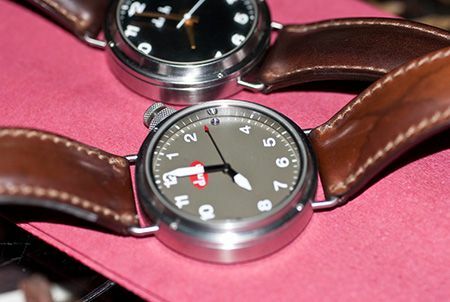 Although the pictures were taken with bad lightning and camera settings, they should give you an idea on the dmh time pieces. Above you’ll see the transparent case back of the watch. The watch itself is made out of 316L stainless steel, is water resistant to 30 meters and always uses a mechanical movement (as the company name implies). Most used movement is a TD movement, however, it is perfectly possible that Fred is going to use other movements in the future as well. 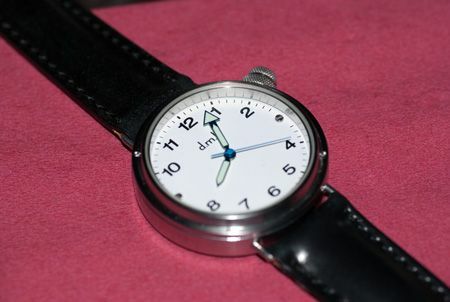 Below you see the customized dmh watch of Victor, with white dial. 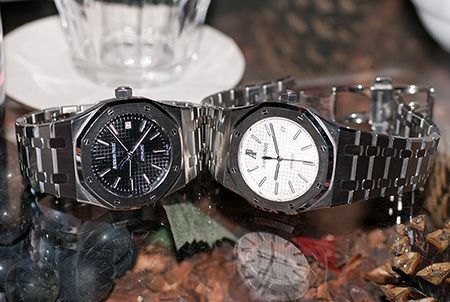 To prevent this diner from becoming a total dmh party, I captured John’s and my own Audemars Piguet Royal Oak 15300ST. Except the number of links in the bracelet and dial colour, exactly the same watches. Two days later, I attended the opening of the Gr?É¬?nefeld boutique in Oldenzaal. Gr?É¬?nefeld became – besides being a watch manufacturer – a boutique for a few other independent watchmakers, such as Sarpaneva, McGonigle, Peter Speake-Marin, Kees Engelbarts and Cornelius & Cie. More about this happening later on this week.